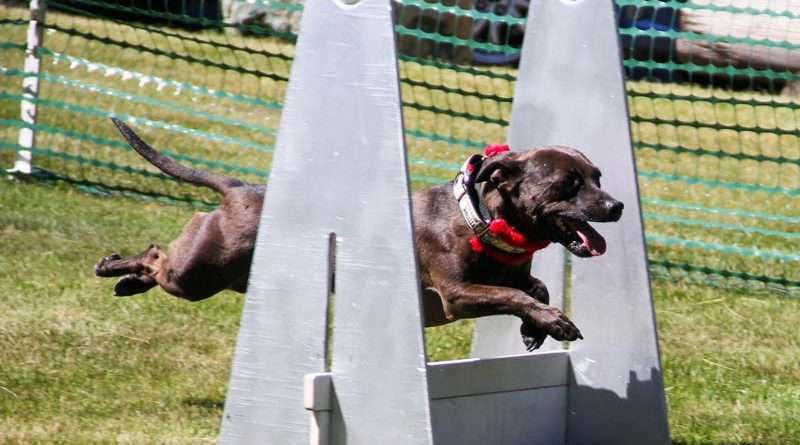 Ruckus, 6, a rescued Staffordshire bull terrier mix from the Reno area, raced through the HSAR obstacle course with glee. His reward at the end was a good session of tug-o-war. 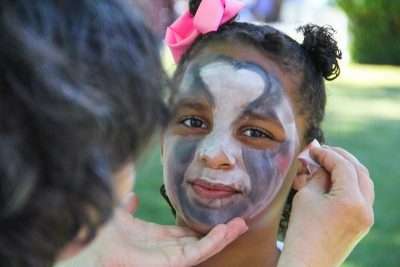 A large selection of vendors offered Paws on Parade festival-goers help with all their doggie needs. 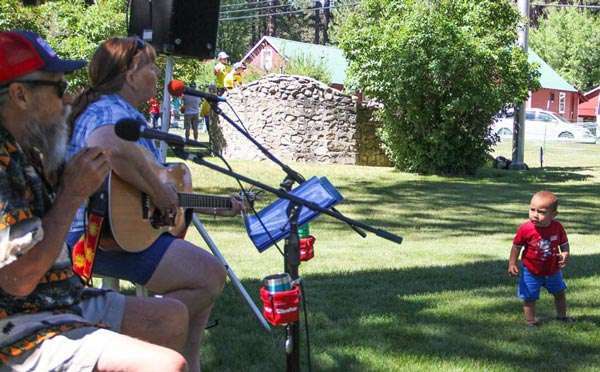 It’s hard to imagine a place where man’s best friend is more loved than Graeagle, the popular Lost Sierra destination where locals and visitors alike gathered June 23 to support High Sierra Animal Rescue’s (HSAR) fourth annual Paws on Parade festival. 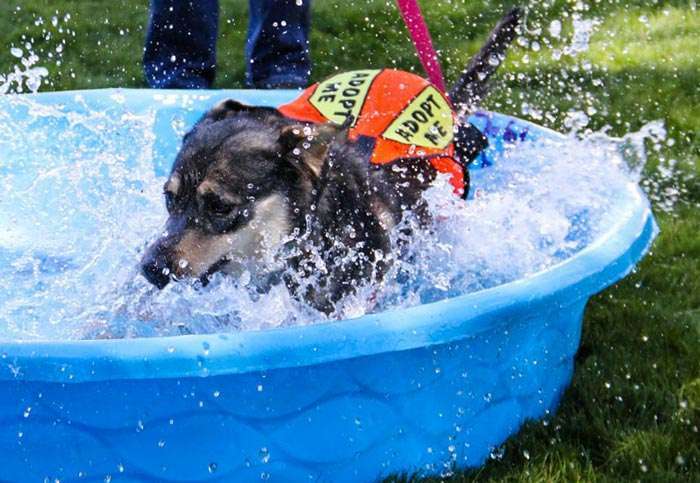 It was definitely dog-heaven at the community event with four-legged sweethearts splashing in wading pools, racing through agility courses, chasing fly balls and gleefully snooping through a straw-filled scavenger hunt for hidden treats. Lined with colorful booths offering services, supplies and adornments for both the human and canine crowds, Graeagle Park’s spacious green lawn was filled with at least 100 dogs out walking their owners.Children sat for face painting masterpieces then ran off with their beloved pets while trainers gave tips to inquisitive folks accompanied by dogs of every size, shape, color and breed. No festival would be complete without good music. “Folks up in the canyon, they don’t mind those city ways,” sang an acoustic duo from Portola, Penny and Dude, who have played together for 40 years. Nearby, a baby danced and swayed to every note, a look of intense concentration filling his tiny face. 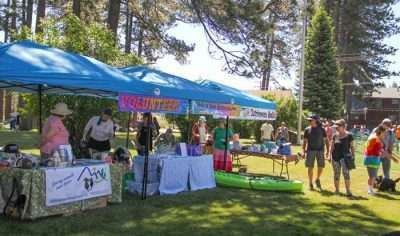 You never saw so many happy dogs in your life as families made their way around the park sharing with out-of-towners the many things they love about Plumas County. Sidney Denham of Maybe was happy to show prospective adopters how sweet and loving a malamute such as Loki, 3, is. “He has a big bark but he likes to cuddle up,” laughed Denham, a graduate of Portola High and FRC. “We vacation here every year and we love this area. 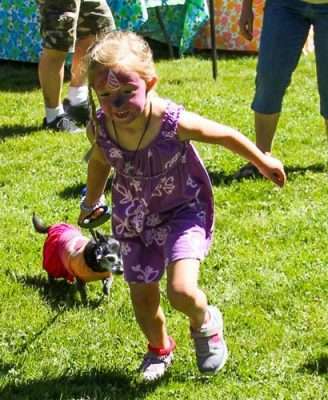 It’s a joy to support this event,” said John Gajdos of Morro Bay whose wife, Elaine Giannini, was carrying around a scrappy little one-eyed Chihuahua rescue named Patches. And then it was time to get ready for the two big events — a wild game of musical chairs (the owners can’t sit until the dogs do) and a Retriever’s Ball at the mill pond. For all the fun and games to be had, the event is a top fundraiser for some very serious and important needs — animal rescue and adoption efforts in Plumas County. “This is a really good adoption event for us,” said HSAR Board Member Carole Scott who manages volunteers for the organization. 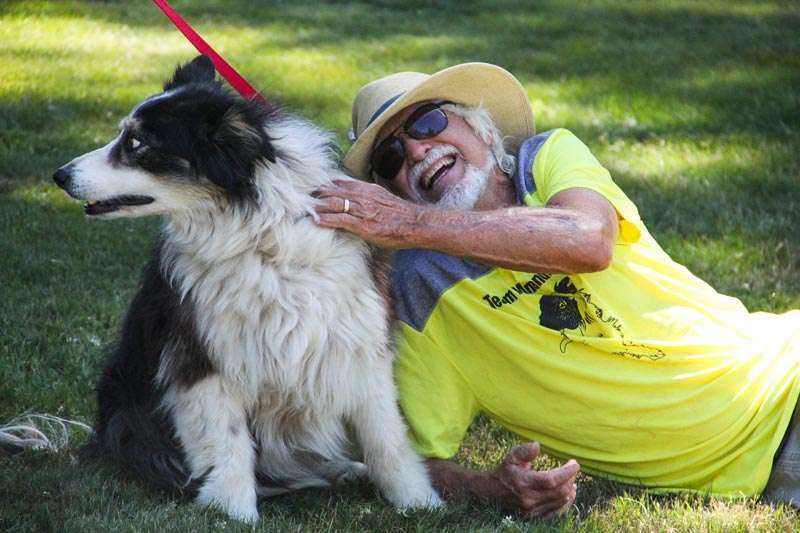 Scott said about 75 dedicated volunteers, many of them snowbirds to the area, make it possible for HSAR to rescue and find new homes for up to 200 dogs a year. The agency offers dogs of all ages for adoption, from puppies to seniors of 8 to 12 years, and assures would-be new dog owners that older dogs make wonderful pets. “Older dogs make excellent companions and right now, we also have two litters of puppies being weaned for good homes, nine of them are a boxer mix and four are black-lab mixes,” said Doug Hart of Graeagle, an HSAR board member who handles public relations. 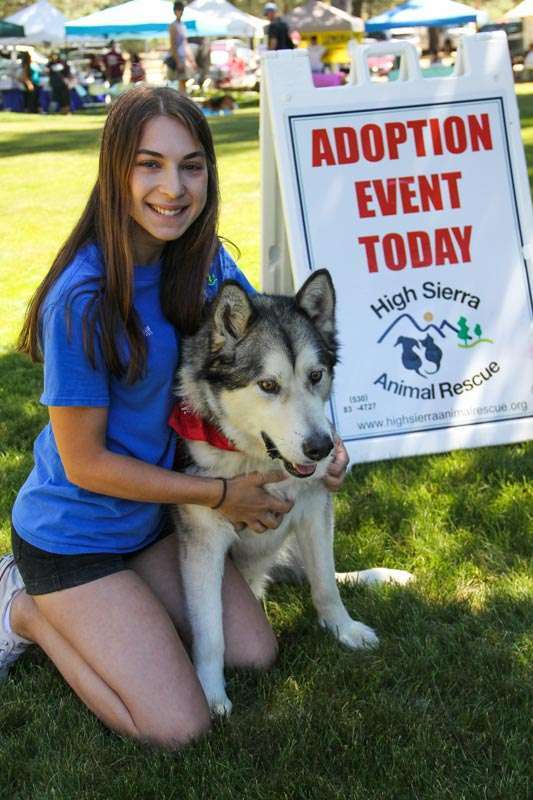 “We do have a specific adoption process and application for our animals and we’re always looking for foster homes, too,” Hart said, explaining that typical HSAR adopters come from all over California, Arizona and Oregon. He added, if you can’t adopt, please consider sponsoring a special-needs animal in their care. Volunteers Mark and Stephanie Stathes of Graeagle serve as adoption counselors and offered plenty of helpful advice for festival attendees considering making a dog part of their family. “Don’t rush to adopt,” Mark said, glancing at his wife who was holding a tiny, adoptable 8-year-old Yorkie mix named Gidget. 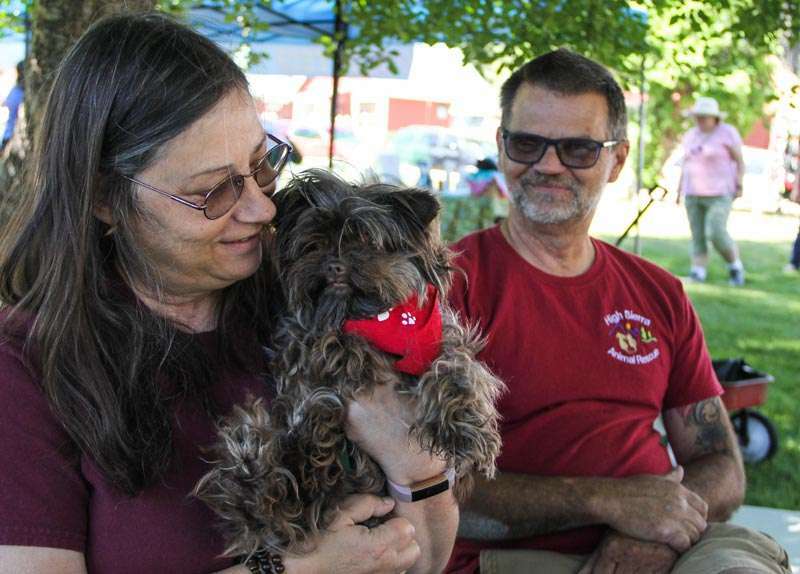 “We always ask people what they are looking for in a dog because we want to make sure the people and the dog are a good fit for each other,” said Stephanie, combing Gidget’s silky fur. The rescue group has been in operation since 1999 and the counselors said HSAR offers various services and programs, including adoption discounts for veterans and a special senior-to-senior program for retirees who adopt dogs aged 8 and up. And everything they accomplish is thanks to their generous volunteers who donate time to the organization. “We always need more helping hands, so even if you can only donate half a day or half an hour a month, please call us to volunteer,” Stephanie said. For more information and a calendar of events, contact HSAR at 103 Meadowridge Lane, Portola CA 96122. Inquiries are also welcome by phone at 832-4727 or email [email protected]. 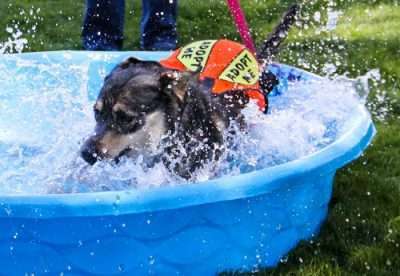 Sweetie, 3, a husky-lab mix up for adoption, loved having a fast and furious dip in the doggie pool. Portola musicians Dude and Penny played acoustic favorites for the crowd while Portola toddler, 16-month-old Nuve Paiva, danced nearby intent on every note. Stephanie and Mark Stathes of Graeagle serve as adoption counselors for HSAR where up to 200 dogs are adopted per year. Gidget, a yorkie mix who is 8 years old, was one of five dogs featured at the Paws on Parade adoption event June 23. Border collie Buddy, 10, received plenty of affection from Peter Dutton of Southern California who was visiting his Graeagle family, the Eglingtons. Portola toddler Piper Wolcott, 2, attended the Paws on Parade festival with her parents Molly and Adam Wolcott and couldn’t get enough snuggling with Chopper, 7, the family’s long coat Chihuahua. 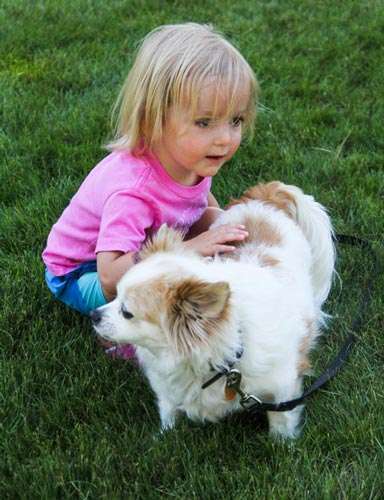 Molly Canova of Florida, 5, visits her grandparents every year and Graeagle is a favorite place to play with their 14-year-old yorkie mix, Maggie.